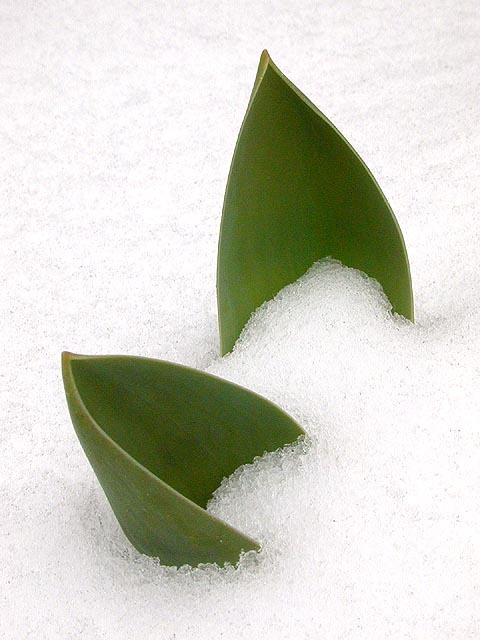 "tenacious grasp of undying winter"
it snowed all late last night and parts of this morning. we didn't get pounded by the tenacious grasp of undying winter, but there was enough to be shoveled. i woke up at 10am (which is starting to become my new wake up time, prior to that it was noon), make breakfast of leftover fruits and some toasted cinnamon bread covered with grape preserve. i called my sister to ask if she was ready, then i went out and shoveled the sidewalk, and cleared the snow off of the car. i like driving with a layer of snow on the roof of the car. i like watching it slide off the car as i make turns or when i accelerate. i went back to belmont, where i saw the powermac 7200/90 my father had found in the streets. the machine looked fine, but it had been stripped of all its dimms so it wouldn't restart, not even with a cd. my sister drove me to needham, to fan susu's tailor shop, where i was going to get my suit altered a little bit. i had asked her to drive me because i didn't know how to get there, but i thought she had some things to get tailored as well, which she didn't. the place was crowded with women, bringing their clothes to be fixed during their lunch break. fan susu told me i could come pick up the suit on friday. my sister drove me back to belmont, where my father and i helped her switch her futon mattress, then i drove back to cambridge. in the park i saw a woman playing with her keeshond in the snow, and made me nostalgic. keeshonden are the best dogs in the world, no other breed of dogs can ever compare. 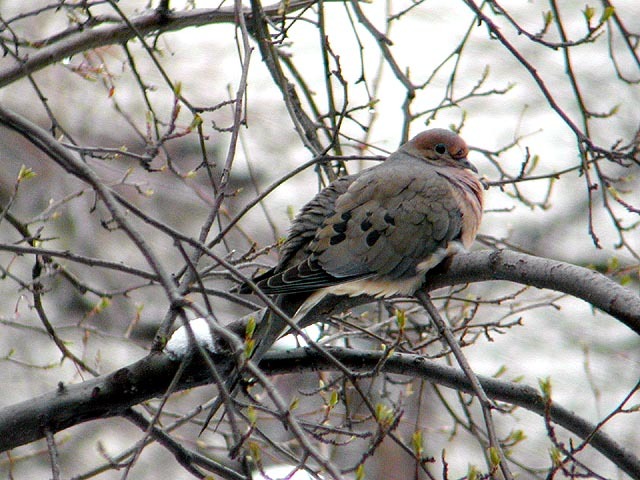 from my backyard i saw a mourning dove, the same one i had seen sunday afternoon (which leads me to believe that it actually lives somewhere nearby). it was sleeping on some branches. i find a lot of animals sleeping in my backyard for some reason. most of the time its squirrels, who after filling themselves with acorns, often time bask in the sun on the deck railings or the fence tops and take a nap, but occasionally i find birds sleeping in the backyard as well. looking for a gift for john miller's wedding this weekend, amy told me i could get a discount if i bought registered crate & barrel through her, which is what i ended up doing instead of going off on my own and getting an unsanctioned gift. it was hard though, most of the good stuff were already purchased by other wedding guests, but i guess most other wedding guests didn't wait until the last week before the wedding to start gift shopping. i read lullaby on the couch, television off (i had enough of war coverage thank you very much), then went to sleep when i felt too tired to continue reading anymore. renata woke me up with a call around 5:30pm to arrange some sort of social event. while on the phone, i saw a couple frolicking outside in the snow, the boy lightly tossing a snowball at the girl, then much hugging and kissing and spinning around. i hissed at them through the panes of insulative glass and made cursing gestures at them. renata told me she was having problems getting into my weblog, and described a mysterious bug that'd spit out either turkish or halloween content. anyone else having this problem? after the call i went back to sleep. i woke up when it got dark, and that's when i heard someone ringing my doorbell. that someone was andrew, my old high school friend, coming by to check out the place to see if he wanted to rent out the guest room for the summer. andrew told me he made a vow to never pay rent, but since we knew each other and he'd know the money would be going to a worthy cause (mainly to help me pay a part of my monthly mortgage), he didn't feel too bad. he told me he won't have a final answer until maybe two weeks later, i said sure, and he left to go to the gym, while i made dinner, which tonight would be korean ramen, not the most inspiring of food. gilmore girls was another repeat, although 24 was new. it was still very suspenseful, but i was able to predict kim's boyfriend miguel had lost his leg (or at the very least the ability to walk, maybe a spinal injury in the car crash) and also that the microchip with the "aif" [sic] files were actually inside the body of wallace. but wouldn't zapping the dude with the defibrillator fry the microchip? and what's up with tony almeida? although i'm glad to see michelle planting a big smooch from next week's preview.